Rock Climbing is fun and an adventure everyone can enjoy. From beginners to experts, there is a rock climbing adventure for you. From indoor rock climbing to outdoor rock climbing, put your skills to the test in a safe and friendly environment. Rock climbing in Brisbane, Adelaide, Perth, Hobart, Sydney, Melbourne and Canberra are among the best locations in the world to experience this great sport. With Australia's natural beauty, getting outdoors with a group of friends or family to experience rock climbing is something you'll never forget. Rockclimbing can be shared with friends and family of all ages. So go on, try rock climbing. You wont regret it. Abseil the cliffs of Kangaroo Point at sunset for Brisbane's best view. Do something a little different at sunset and repel down the spectacular cliffs of Kangaroo Point. It's only a matter of confidence - let skilled and friendly instructors guide you on a gorgeous, adventurous evening out. 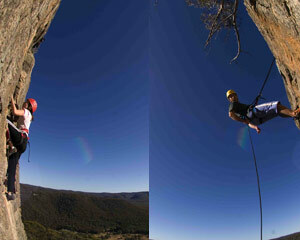 Learn to abseil right in the heart of the spectacular Blue Mountains. With heights ranging from 5 metres to 60 metres - why pay for full day abseiling when you can get real high in 4 hours? Awesome! Suitable for all - from beginners to experienced. This is an experiential abseiling course, designed to allow you as many descents as possible. The focus is on developing good abseil technique, safe practice, personal confidence, and having fun. 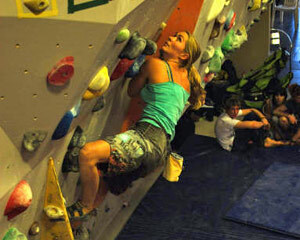 You'll also get a chance to try out some rock climbing too. This is an experiential abseiling course, designed to allow you as many descents as possible. The focus is on developing good abseil technique, safe practice, personal confidence, and having fun. You'll also get a chance to try out some rock climbing too! Join us for a session of adventure and learn the "ropes" of abseiling. Based in the beautiful Blue Mountains, you will be given professional guidance, with your safety being our number one priority. This is a day of fun, suited perfectly to those who are beginners to this awesome sport. 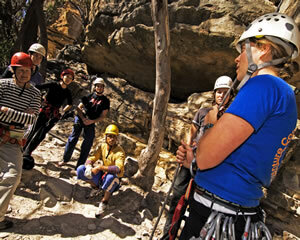 Experience the thrill of abseiling with your experienced adventure guide at Cotter Rocks. This challenging experience is sure to excite with its 20m+ abseils and guided half day expedition. Abseiling for beginners with plenty of time to 'learn the ropes' on 3-5 metre high practise slopes. 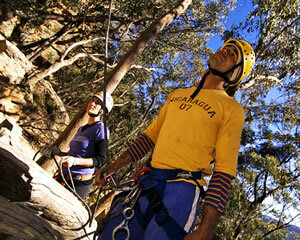 Do as many abseils as you want in beautiful bushland, makes for a great introductory adventure! Kangaroo Point, in the heart of Brisbane's CBD, provides the perfect opportunity for you to enjoy an introduction to the vertical world of abseiling. After learning the necessary safety procedures and taking a training run you are free to have as many goes as you like! The Ultimate Abseiling Adventure Day! Abseiling is an exciting adventure sport that everyone can experience and enjoy! We use the most experienced instructors in Australia. Our team will ensure that your Abseiling Adventure is one that you will never forget! Riverlife abseiling sessions are guided by qualified and experienced instructors. No experience is necessary as each session includes instruction, a safety briefing (where you will learn how to abseil) and equipment. Immerse yourself in the spectacular scenery of the Sunshine Coast Hinterland as you abseil and rock climb the amazing cliffs of Mt Ngungun in the Glasshouse Mountains, located less than 1 hours drive north of Brisbane. This is a great introduction to climbing and abseiling for adventurous people. The ultimate Abseiling Adventure day! Abseiling or rappelling in the breathtaking Blue Mountains is a sport that everyone can experience and enjoy. Qualified and experienced instructors will ensure that your Abseiling Adventure is safe and unforgettable! Lunch and refreshments are included. Launceston in Tasmania is a climbers paradise, with 500 breathtakingly scenic climbs a stroll from the city centre. This climbing and abseiling session is perfect for beginners or advanced climbers. Experience the thrill of abseiling with your experienced adventure guide at Cotter Rocks! This challenging experience is sure to excite with its 20+ metre abseils and guided half day expedition. You can even test your bravery and challenge yourself to abseil face-first! Bluff Knoll - a massive 250 meters gives simply the ultimate abseiling experience! This is where WA abseiling culminates, with a 250m multi-pitch descent. Imagine two days in the south west of WA participating in a challenging activity that's totally different to the normal abseiling experience! Fancy yourself as a bit of a Spiderman? Abseiling face-first down a seven-storey building in the heart of Melbourne is not something that you'll get to do every day. However if you love adrenalin and exhilaration, rap jumping is definitely something to add to your repertoire of extreme adventure! So, you've tried abseiling, but find it a little tame. In Victor Harbour, do an abseiling forward run to give you an adrenalin rush - abseiling forwards and running down the side of the cliff! Perfect for those with a fear of nothing and who like to look it right in the face! A fabulous activity to push the boundaries of what is considered possible. Abseiling is a great introduction to the vertical world. Originally simply a way of getting to the bottom of a climb, now a thrill of its own and accessible to people of all ages. 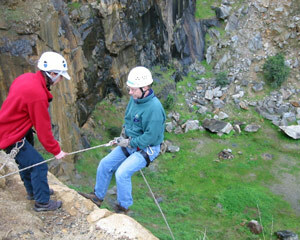 This Abseiling Half Day adventure in the Adelaide Hills is designed especially for those who are seeking a real adventure and have never tried abseiling before. Abseiling is the ability to descend from steep rock faces using ropes. A must for outdoor thrill seekers! Try abseiling, it's a real adventure blast, which introduces you to the vertical world! Enjoy the thrill of climbing down cliffs in the Glasshouse Mountains whilst taking in the pleasant serenity of the area that surrounds you. Beginners are more than welcome. Abseiling Mt Tinbeerwah is a great way to get back to nature! Take in the natural beauty and the sights of Mount Tinbeerwah, near Noosa, on your full day abseiling adventure. Two hours of Abseiling at Kangaroo Point cliffs. Abseil off the main 20 metre cliffs and marvel as the Brisbane city skyline turns from day to night behind you. Linger a little longer after your session and enjoy a complementary glass of sparkling wine and nibbles and take in the views. Take a clear blue sky or a starry night, a view of the city of Brisbane and the Story Bridge dancing with lights. Then add the excitement of abseiling over the Kangaroo Point cliffs. Finish your abseil with a bottle of champagne and nibbles. Truly an experience to remember! This one day program has been designed to allow you as many opportunities as possible to try abseiling and rock climbing. A abseil adventure afternoon for two. Safely step over the edge of the cliff and share the experience with your buddy. The cliff is surrounded by native bushland and you can hear the call of bellbirds while you abseil. With an elite athlete as your guide, take a behind-the-scenes tour of the Australian Institute of Sport and get an insight into the life of a top sportsperson. This is the best Blue Mountains' introductory canyoning experience, water jumps, swimming and "shooting the rapids". An average level of fitness is required, but no experience on a rope is needed as we will teach you how to abseil. This is a day you'll never forget. Test your determination and challenge yourself on this great one day rockclimbing abseiling adventure! After a day of complete adventure - then this is for you! Over the whole day you'll learn to abseil and climb sheer cliffs (grades up to 17). After a picnic lunch, enjoy a relaxing bushwalk into the Jamison Valley. Overnight hostel accommodation & Blue Mountains bus tour on day two is also included. 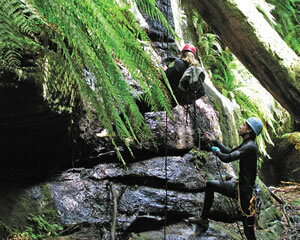 This canyoning and abseiling NSW adventure in a spectacular way to see the Blue Mountains! Led by professional guides in the world's best adventure environment, you will combine water jumps, subterranean swims and waterfall abseils, all set against a stunning Lost World backdrop! This caving adventure is perfect for anyone who has had some experience caving, abseiling or rock climbing. You will be caving in the Labertouche Caves, just 90 minutes outside of Melbourne. Explore this unique granite boulder cave system and discover the secrets of an underground maze. Climb Brisbane's Story Bridge - a child won't forget it, and a pensioner can cross it off the list! It's easy to see why this experience is one of the most popular days out in Brisbane. Choose a dawn, morning, twilight or night climb, and let your friendly instructors guide you safely to heaven! Learn the basics of climbing and develop your climbing technique with Australia's #1 female rock climber, Sam Berry. Come and learn canyoning, water jumps, floating and "shooting the rapids" on Lilo's down idyllic clear mountain streams. An average level of fitness is required, but no experience on a rope is needed. A true adventure you will never forget. Canyoning is a combination of mountain streams, subterranean swims and waterfall abseils, set against a "Lost World" backdrop. Be part of a truly unique wilderness tour led by professional canyoning guides in one of the world's most famous introductory canyoning adventures! Learn to abseil right in the heart of the spectacular Blue Mountains in the morning and experience the awesome exposure on an expedition down sheer cliffs in the afternoon! With heights ranging from 5m to 60m, views to the Three Sisters - what could be better! For beginners to experienced. Grab a friend and come rock climbing. You will find yourself in a spectacular setting throughout the Grampians National Park or Mount Arapiles where you can have your own unique experience in the vertical realm of rock. Caving is unique, there is no two ways about it. Simply being under ground can be challenging both mentally and physically. The even more amazing part is that you will be able to explore a whole new world...under the ground! This full day introductory rock climbing and abseil adventure in the Blue Mountains is the perfect gift for someone adventurous, and a great introduction to rocksports. No experience necessary! On this wet canyon trip you'll have an adventure day you'll never forget. A full day of abseiling, swimming and walking. We will negotiate our way through rainforests, caves, waterfalls and crystal streams. Lunch and snack are included. This is an instructional two-day course designed to develop the technical skills, experience and confidence needed to safely pursue lead rock climbing. The Margaret River Discovery is a high quality program of fun and excitement! We combine the three challenging activities of rock climbing, abseiling and caving with dorm style accommodation in the magnificent Margaret River area for an inspirational weekend you won't forget! The Margaret River region is renowned as a popular spot for outdoor sporting activities! On this weekend adventure, we combine the 3 challenging activities of rock climbing, abseiling and caving with camping in the magnificent Margaret River area for an inspirational weekend you won't forget!